CONVERT PDF AND EDIT PDF! Premium PDF TO WORD Converter to edit and change PDF files with Microsoft Word. Super fast conversion rate! SPLIT PDF AND MERGE PDF! 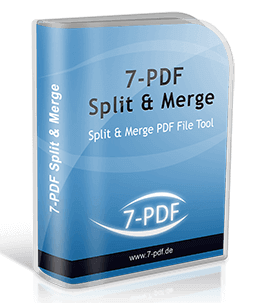 Our easy to use PDF Split and Merge FREEWARE! Extract and put PDFs together up to 3x faster than other tools! Our PDF CREATOR FREEWARE with Citrix XenApp and Terminal Server Support. Can also be used as PDF Network Printer! Premium PDF Tools for TOP License Price! » PDF to Word converter of the premium class! » Cutting and merging PDF files is child's play! PDF to Word converter of the premium class! » Edit PDF files with Word! Split and merge PDF files together! » Split and join PDF for free! A PDF printer for everyone! » Creates PDFs for free when printing! Become a happy user among millions around the world! We are a german software company and manufacturer of the product line 7-PDF. Our specialty is the development of user-friendly PDF products! Millions of installations of our various PDF products since the inception of 7-PDF in 2008 will help you in your daily work with PDF files! we have developed easy-to-use, manageable complex powerful PDF software products. And the feedback from our users, companies and partners, as well as the ever increasing number of users around the world, confirms us! Our services are your advantage! Our PDF programs complement each other, and usually integrate seamlessly into the system landscape of your company. The programs are lean, all Citrix and terminal servers capable and require a minimum of resources compared to similar PDF solutions. The COM objects (PDF API) installed with PDF Maker and PDF Printer can be flexibly used by developers to generate PDF files. All common COM supporting programming languages like C #, VB.NET, VB6, DELPHI and many more can integrate and use these! Many of our PDF programs can be used as freeware. Our Free PDFCreator and PDF Split and Merge (pdfsam) Tool, as well as our Free PDF Printer (Community Edition) are based in development on our many years of experience and the many feedback from our users around the world! As an international manufacturer, we offer a free and non-binding English language support for all our PDF products. On which operating systems are your products running? All our PDF programs have been developed for Windows 10, 8.1, 8, 7, Vista, XP and for Windows Server 2016, 2012, 2008, 2003. Yes, but only for our commercial PDF programs. For our PDF Printer 7-PDF Printer, this option is optional for customers, for example from the company licensing. For group licenses of our other commercial PDF products, we optionally offer maintenance contracts upon customer request. All other users can contact our non-binding english-speaking support in case of problems, this is generally available free of charge. Do I have to reckon with the license purchase with annually recurring license costs a la ABO? Definitely not! All our paid programs are not subject to subscription compulsion. With us you receive only Lifetime licenses. Our low-priced license fees will only be charged once for all our paid programs! This sets us apart from many other PDF providers. What payment options are available when purchasing commercial products? Companies, authorities and associations can order directly from us. We offer all other licensees an online license purchase through our distributor share-it Digital Rivers. The payment method available is PayPal as well as credit card and bank transfer. The accounting is done after the purchase here by shareIt and not by us. Are there any trial versions for your commercial programs? Yes, all our programs run directly in the functionalities of the freeware variants, which usually contains all the functions you want to test. All programs can therefore be extensively tested before upgrading to a PRO variant. You basically never buy the cat in a poke. Do I have to be "online" to use their programs? No. All our programs are installed locally on your system and do not require internet connection. Not even for the licensing process and certainly not for the daily work with their files! What is stored on your systems stays on your systems. Will I receive a software box and manual when purchasing the products? No, all our programs are provided purely electronically. We do not ship software boxes and paper manuals. Alone for cost reasons. We prefer to pass these savings on to them - through cheap and fair license prices. How do I get my purchased and thus licensed full or pro version? You can always download our programs in their latest version from our website. The installed programs can then be automatically converted to the licensed full or pro version by entering a license key. However, you will receive this via e-mail after purchase, and thus electronically, an exact guide. A new installation is no longer necessary. Your invoice will also be sent to you by e-mail as PDF. We have made you curious and you want to know more about our PDF products, then follow us now on the product overview! 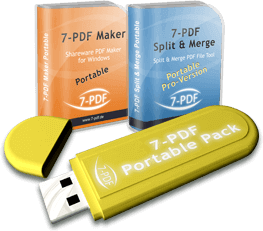 Here you will quickly find the entry point to other important information about our 7-PDF Tools PDF Printer, PDF Split and Merge, PDF to Word Converter, PDF Website Converter and PDF Maker. Create PDF files with software from 7-PDF for free. If you are interested, take a look at our products PDFCreator (PDF Printer) and PDF Maker (PDF File Converter). The free PDF tools offer extensive features and PDF conversion options for creating PDF files. 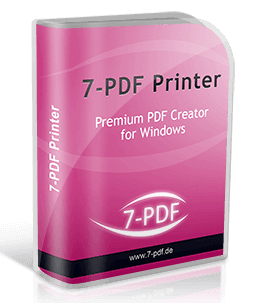 The solution for printing PDF files at 7-PDF is our PDF Printer. PDF Printer comes with professional features like PDF security, PDF creation with digital signature, PDF generation with watermarks and PDF backgrounds and much more. Printing a PDF from any Windows application is guaranteed to be child's play with this software. Edit PDF, no matter if with Microsoft Word or to split and merge PDF files. Again, we have the right software products at the start. For editing PDF files directly with Word, our premium class PDF to Word Converter is available to you, and to split and merge PDF files, simply use the freeware PDF Split and Merge. Edit PDF files for free with Microsoft Word™! If you want to edit a finished PDF, good advice is often expensive! Why should not you use Microsoft Word for PDF editing if you have already installed it on your system? In this article we show you step by step how easy it is to edit PDF files with Word! For this we use our PDF converter, by the way one of the best PDF to Word converter on the market! PDF Creator - Create PDF files 100% free! Our free PDF printer (Community Edition) can be used from almost all Windows applications. Creating PDF files with watermarks and background templates, merging multiple PDF files, setting a PDF password and much more is possible. Starting with the commercial version Professional Edition, our PDF printer can be set up in the network as a PDF network printer, but can also be centrally provided on Citrix and terminal servers! With our free PDF Split And Merge, existing PDF files can be split or merge in a user-friendly and performant way, and that without using JAVA and .NET! For all these purposes, the software offers flexible split and merge routines for the respective application, which are very easy to use. More, mostly free PDF tools from 7-PDF can be found in the products section! Whether the well-known PortableApp software PDF Maker or PDF Split and Merge for the USB stick, or our favorite HTML to PDF Converter to faithfully transform a webpage into PDF format. It is definitely worth taking a look at our extensive PDF software catalog. We have the right product for each of your PDF projects!